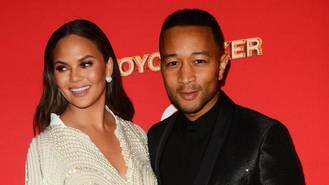 The 37-year-old singer is father to seven-month-old daughter Luna with wife Chrissy, 30. While the pair had difficulty falling pregnant the first time around, their struggle hasn't put them off hopefully extending their family in the future. "It’s a beautiful thing. We want to have a few more hopefully. Three or four. We'll play it by ear though," John said during an interview with Mr Porter's The Journal. While the pair eventually underwent IVF to conceive, they were never given a specific reason for not being able to fall pregnant naturally. "We’re just happy that we were able to do it with our doctor," John continued. "He's never really told us that there was something specific that he could identify was the reason why it just didn't work out naturally. We did what we had to do." John is now working hard promoting his new album Darkness and Light. But his daughter is never far from his mind, with the singer admitting she inspired his music before she even made her grand entrance into the world. "As soon as we found out we were pregnant, I started writing songs about what it felt like to be a new father,' he said. 'I already was so inspired, before I even saw Luna," he smiled. Clearly revelling in his new role, John is now keen to dial back on his professional commitments so he can be at home more with wife Chrissy. And when it comes to heading on the road to perform for fans, John is hoping the model and baby Luna will come with him. "I want to work less now, you know? I want to be home more, and be able to just help my wife with whatever she needs," he said. "Also, just be there to experience (Luna) growing up. I want to take them on tour. I want to be around."